LIEZL is holding a May Giveaway for followers. 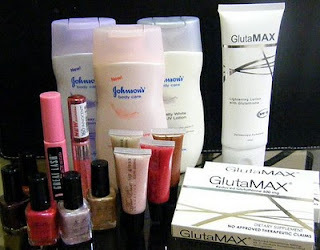 The makeup prize loot includes a Maybelline Great Lash, Rimmel Volume Boost Lipgloss and full-size Johnson and Johnson's Lotion Bottles. "What is your favourite summer event/activity?" School days are over so I have more time to swing in a hammock, snuggled close to my child. We sway the afternoon away. I define summer as a time for a stress-free transition into what used to be called the fun, lazy days. I also look forward to going to the beach or swimming pools for a day of fun filled with refreshing snacks and barbeques.